We have several designs that are either partially or fully hand painted with lustrous enamel paint. Painting- anything really is one of my favorite tasks to do in the studio. I love enamel painted flowers for many reasons the first of which is that I get to pick up a paint brush! 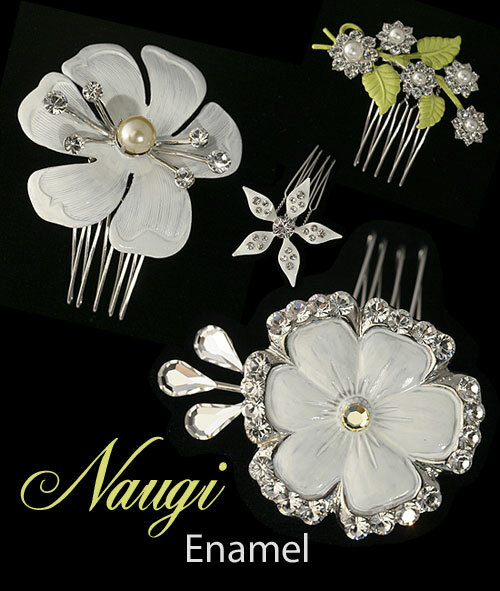 The final effect of painting can create a sheer layer with bits of textured metal showing underneath such as the Dogwood Single Flower Comb, pictured above, or the effect can be a lustrous opaque and shiny surface such as Plumeria Comb, also pictured above. The new Plumeria collection has been a instant favorite- creamy paint studded with Swarovski crystal. Gorgeous!!!! A customer recently said she needed several Plumeria flowers to get through a Hawaiian vacation. Thank you I love comments like that!!! Our standard paint color is white, but if you ask… we can offer a variety of colors the most common of which is ivory (I wore ivory painted Lilac Hair Ornaments for my own wedding), but we also can paint green, pale yellow, pale pink, and pale blue just to name other common colors. We will be happy to send color swatches of any color you might be interested in!